A concert has been held to remember the victims of an IRA bomb which exploded in Kent nearly 20 years ago. 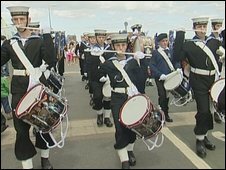 Eleven Royal Marine musicians were killed in the explosion at Deal barracks on 22 September 1989. More than 20 others were injured. Other memorial events in the town on Sunday included a march-past at the site and a minute's silence. No-one has ever been convicted over the deaths, caused by a 15lb (7kg) device planted in a recreational centre. 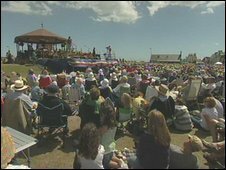 Former staff band leader Jay O'Neill, of Hastings, Sussex, who was injured by the bomb, was at the concert, where the refurbished bandstand - a memorial to the musicians who died - was being rededicated. He said it was important to remember what happened, but also to celebrate the lives of those who died. Speaking before the concert, he said: "It will be tough when we come to the memorial part of the service when they rededicate the bandstand to the 11 lads that we lost, and they read out their names. "That is the time when you start thinking about them more closely and I'll have a tear in my eye." Graham Hoskins, former director of music for the Royal Marines and a retired Lt/Col, said: "There are a great number of the bereaved here, who quietly come and don't want to be recognised. "They are sitting in the audience. They've come and they will be immersed in their own memories today." Lt Col Woody Page, of the Royal Marines at Naval Command Headquarters in Portsmouth, said: "This was an abysmal crime and it's only right and proper that 20 years on the deaths of the Royal Marines are commemorated. "It demonstrates to the community of Deal our thanks for their enduring support and moreover to the families of those fallen Royal Marines that they will never be forgotten." Labour MP for Dover and Deal Gwyn Prosser said: "It was the fact they were held in such high regard that shocked people to the quick. "They were such soft targets. They were not armed personnel, they had no real security, they were just musicians." The explosion flattened a three-storey accommodation block and caused widespread damage to nearby civilian homes. A week after the bombing, members of the School of Music marched through Deal and maintained gaps in their ranks representing the positions of those killed or injured. The town's memorial bandstand - where thousands turned out for Sunday's concert - was erected in 1993 on Walmer Green featuring the names of those who died on 11 sides of the 12-sided structure. The Royal Marines School of Music relocated from Deal to Hampshire in April 1996 - a housing development is now located on the site of the explosion, along with a memorial garden.